For those who haven't seen, Part One of my End of 2010 Giveaway is located HERE. And for those of you who have a Wii, here's your free chance to win a brand new copy of Donkey Kong Country Returns. The reason why I have a giveaway with this item is that while I love cooking and coming up with new recipes, I'm also a total and complete nerd. I mean, its in my Job Title (Software Engineer). 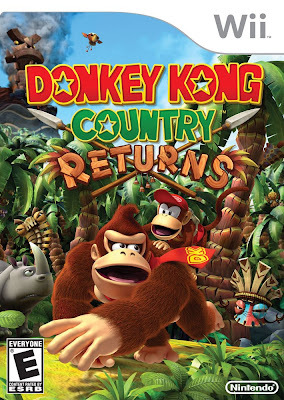 I've always had a love for video games, and in a year of many good video games (2010 in my opinion was the best year for gamers this side of 2000) Donkey Kong Country Returns stood out as the best in my opinion. So look below for the rules and how to enter! A free copy of Donkey Kong Country Returns for the Nintendo Wii! Follow my Blog using the Google widget on the right sidebar, and comment on this post if you're interested in entering. Share this contest on Facebook or Google Buzz using the Share Buttons on this post. Leave a comment on this post saying you did this (I have no easy way of tracking this like I do with Twitter). Enjoy, and thank you to all my readers! Thank you for teaching me how to follow your blog which I (turns a little red) really had no idea how to do before... I just check it all the time! I would like to win a Donkey Kong Wii please so then maybe I'll have motivation to buy myself a wii so THEN I might also buy a wii fit and THEN I would exercise more. But really, I just want to play Donkey Kong allthetime. ps- why in the world do you have an EXTRA copy of this? I called one of my friends that's worked at GameStop for a long time, and they're giving me a very discounted copy of it for the giveaway. Oh my goodness, I want this game so badly. I loved playing it on our old Nintendo system. Best game ever! Thanks so much for the opportunity to win. I am following you via Google Friends Connect. I Google Buzzed this giveaway. Glad to see you are still making delicious NOMS despite the gluten set back. I also think it is really cool that you are doing these giveaways. Whenever you are down in CVille let Josh and I know! Happy holidays and hope you have a good new year! Hey Miles! Thanks for posting and I'm glad you enjoy. I haven't been to Cville in a while, but I'll let you know when I'm down there again. Happy New Year!